The Aeolian Choir has for many years supported local schools by donating music prizes. that were close to the heart of the choir. The first week in February was a very busy week for the Choir.The Aeolian performed at a charity fundraiser at St Columba's Parish Church in Ayr. 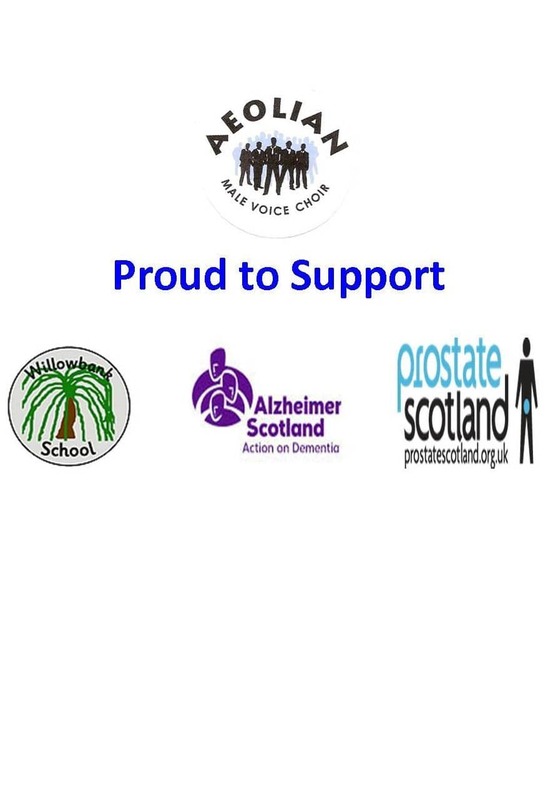 Later in the week the choir were guests of the Kilmarnock Concert Brass at their fundraiser for Alzheimers Scotland in the Park Hotel Kilmarnock.These two concerts raised over £2300 for their respective charities. February saw President Reg Short & Vice President Bill Armour visit Willowbank School in Kilmarnock. They were treated to a tour of this excellent facility by Mrs Tracey Smallwood & her Staff. The time spent with the pupils in the music room was a wonderful example of how music enriches all our lives. Reg & Bill really got into the spirit of the moment and some of their dance steps had to be seen to be believed!! President Reg then presented Mrs Smallwood with a donation from the choir. This season has been a busy but rewarding time for the choir. The joy of singing & giving to such worthy causes is a wonderful experience. Is your Organisation thinking about a fundraising event?